Are you ready for the winter? Is your home? Just as you get your car ready for winter by putting on snow tires, it’s important to pay special attention to your home. There are a number of things you can do to optimize your home to stand up to the ravages of the cold winter months. 1. Have your furnace inspected & serviced. It’s a good idea to have an annual inspection and maintenance on your furnace, so why not have it done just before the cold weather hits. This is especially true if your furnace is not exactly new. It might need to be cleaned or it might need some other minor maintenance. The last thing you need is to wake up one freezing cold morning in January and realize that you are without heat! 2. Give a thorough once over to all windows and doors. The best way to let heat escape and let cold air in is to leave crevice cracks, cracked window glass or exposed entry points around pipes. A good way to discover where cold air is getting in is to go around the house on a windy day and check (either with a lit incense stick or a feather) all drafty areas of your home. Pay special attention to window and door frames, electrical outlets and recessed lighting. Ensure that you seal (by caulking or using weather stripping) every entry point for cold air. Not only will doing this keep you warm and toasty, but it can substantially reduce your energy bills! 3. Add a little extra insulation in the attic. In the same vein as point number 2 above, it might not be a bad idea to add some insulation to that which already exists in your attic. A good rule of thumb is that you should have at least 12 inches of insulation in your attic. You should not be able to see the ceiling joists in the attic. If you can, it’s time to layer some more insulation in there. Again, just think of the money you’ll be saving on your heating bills. 4. Reverse the direction of ceiling fans. This is a very simple thing to do and by doing it, you’ll be pushing the warm air downward for a toastier effect. 5. Clean your gutters. Nobody really likes this job, but it’s not such a hard thing to do. Just get up on the old ladder and make sure that leaves and other debris are cleared. 6. Have an emergency kit ready at hand. You never know when the power might go out, or for how long it might be out, so it’s always a good idea to prepare an emergency kit available. Here are some thing to include: candles, a lighter (or matches), bottled water, non-perishable food that doesn’t necessarily need to be heated to be enjoyed (including pet food, if applicable), a first aid kit and a battery back-up for your computer. 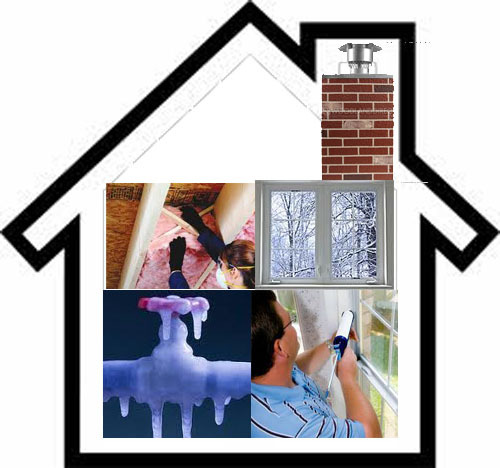 This entry was posted in Blogs, Real Estate, Social Networking, Traffic and tagged winterize your home. Bookmark the permalink.